I got this recipe of the internet a year ago and feel in love. 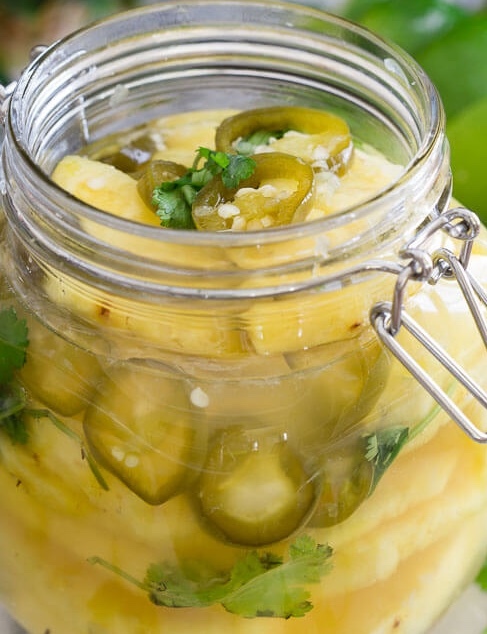 Pickled pineapples, yes please! I love pineapple and here recently, I like things a little spicy, trust me that is new, spicy was something I avoided but I am now dipping my toe in this warm and tasty world. Place the vinegar, sugar, jalapeno, salt and lime juice in a small sauce pan. Bring to a boil stir until sugar dissolves, remove from heat and let cool to room temperature. Place the pineapple and cilantro into a large jar. Pour the vinegar mixture over the pineapple, it should just cover the top slice. Seal and refrigerate at least 1 day before enjoying.